Party Warehouse hires a huge range of quality tables and chairs for weddings, parties and events in Christchurch. The 6ft trestle tables will seat 6 guests comfortably, while the 8ft trestle tables will seat 8 guests. Party Warehouse also have a limited number of smaller trestle tables for hire, which are commonly used for cake tables, jukebox tables, signing tables, trade shows etc. 0.8m (3ft) Round table (grey plastic, folding legs). 0.9m (3ft) Round table (white plastic, push in legs). The 3ft round tables will seat 4 guests (for dinner, 4-6 guests if casual seating), whereas the 5ft and 6ft round tables will seat 8 and 10 guests respectively. Party Warehouse has a limited number of 76cm (2.5ft) round tables for hire which are commonly used for wedding cake tables. 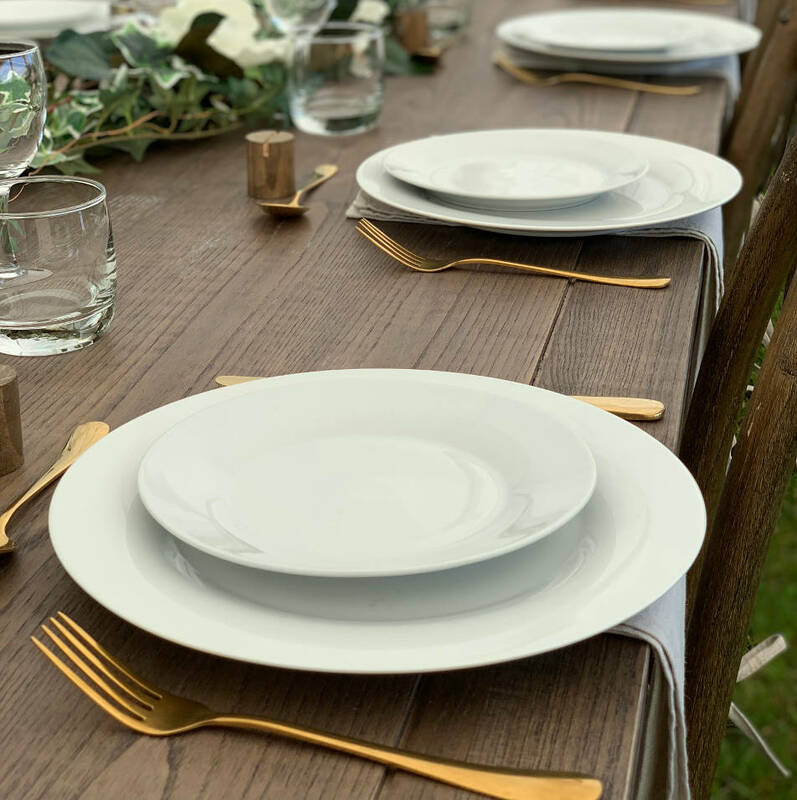 Elegant Bentwood Chair - The Bentwood chair is an elegant wooden chair with soft rounded lines making this a perfect fit for both wedding seating or corporate event seating. Rustic Cross Back Chair - Our cross back chair has a rustic finish, this chair is perfect for events, weddings or functions. The black folding chair is easily our most popular chair. Lightweight chair, easy to transport, durable and comfortable. The white folding chair (non padded) is suitable for events, but we recommend the black folding chair instead. The white padded folding chair is an elegant and popular option for wedding receptions and wedding ceremonies. The Vienna chair is a sytlish high-back white resin stacking chair which is ideal with chair covers (due to the high back). The Pipee chair is a great option for parties and events. The Black Cafe chair is our most comfortable chair and is recommended for business functions and events. Party Warehouse hires high quality table cloths and linen napkins for weddings and parties throughout Christchurch and Canterbury. We also hire chair covers, chair cover sashes, table runners and more. View Linen and Chair Cover Hire for more information on table linen and chair cover hire. 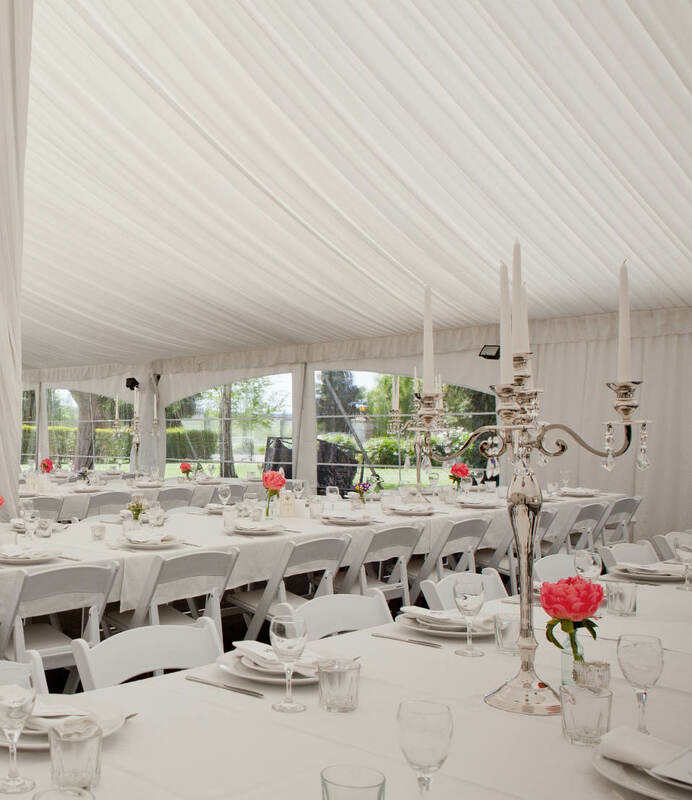 High quality linen and chair covers suitable for weddings and events in Christchurch. Party Warehouse hire bridal tables for 2pp - 12pp although we can customise a longer table for your wedding if required. Bridal tables usually include "boxed" linen which covers the front of the table, however we can include pleated table skirting if that is the look you desire. Party Warehouse has round and square wedding cake and signing tables available to hire with linen and/or table skirting.